Think back to where you were at 19-years-old. Did you pay your way through college? Did your parents give you a free pass? Some of you may have a story of untold responsibility at a young age. Some of you may be unable to comprehend such a burden placed on a teenager. Either way, for most of us, we at least had a few options to pay for our college education. The reality for many young girls in rural India is that a college education isn't promised, and the alternatives can be grim. In fact, according to a study done by development economist, Abusaleh Shariff of the Delhi-based Centre for Research and Debates in Development Policy and Amit Sharma, research analyst at the National Council of Applied Economic Research, only 10% of college-aged students in India have access to higher education. In some places throughout the country, this number can drop to just 4% of women that have access to higher education. In some areas of India, just 4% of women have access to higher education. Pooja, like many young girls in India, wasn't promised an education, and most certainly couldn't guarantee her future would hold a well-paying, stable job. She had a desperate desire to further her high school level education, and the hope in her eyes could prove wrong anyone who discouraged her. Pooja came to the White Peacock with her mom and sister in 2013. 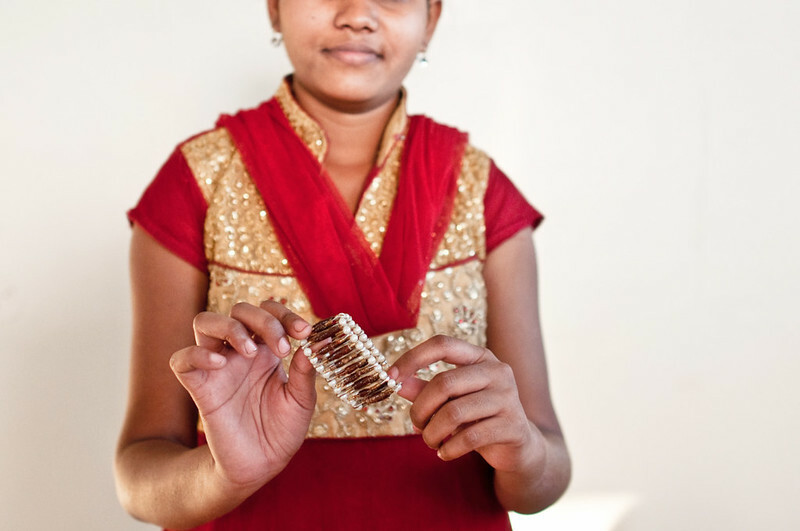 While her mom created designs to provide for her family, Pooja used her talents to create goods that would help give her the college education she desired. She was able to work from home, with her mom and sister, exploring the creative talents she had within her. Pooja's entire family had a knack for embroidered work. This young lady loved to explore what new designs she could make with her hands. 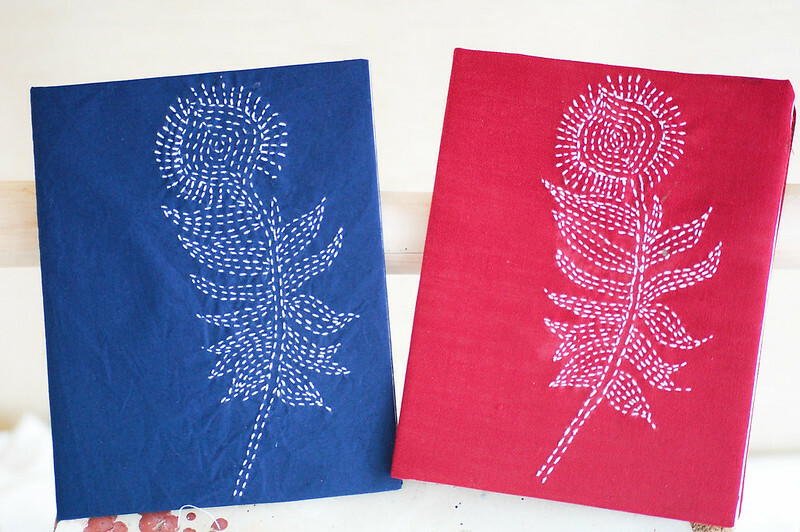 One day, Pooja brought in a sample of a fabric, embroidered journal. Thin thread, weaved in-and-out of brightly colored fabric, displayed the picture of a beautiful peacock, India's national bird. From this day on, things began to change for Pooja. Her embroidered journals were a hit, selling well from the start. 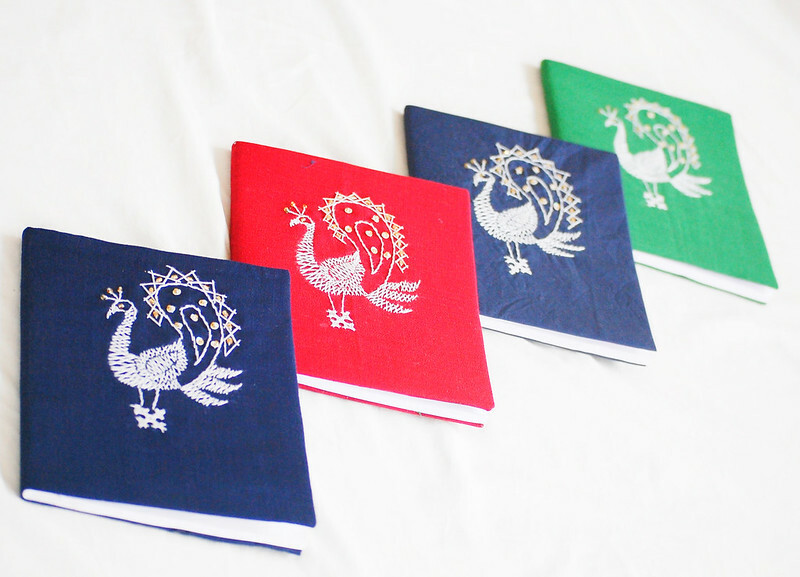 She's made a huge variety of journals, but her Embroidered Peacock Journals have always been the best seller. 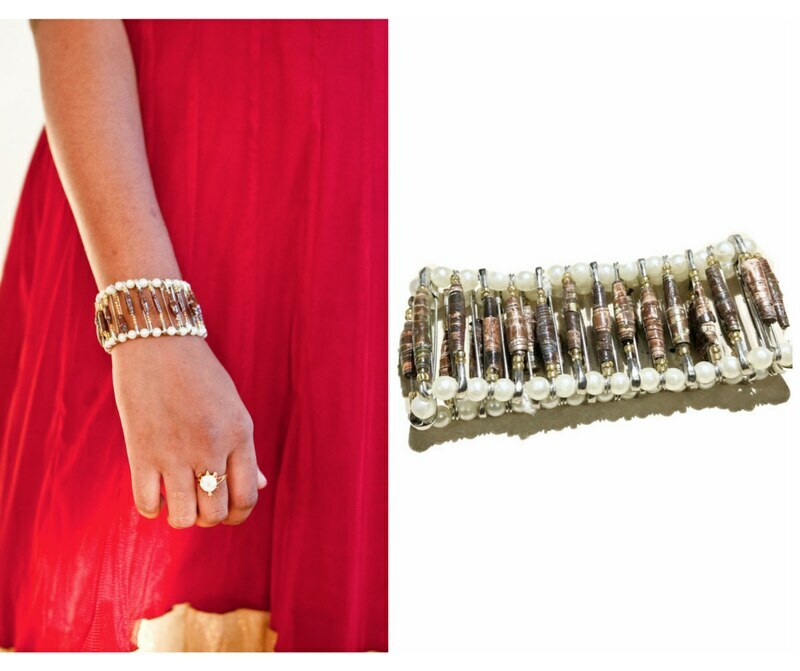 Pooja's also come out with an innovative design that uses recycled newspapers and Sari pins to create a stunning beaded bracelet. You can see this latest creation here. During the past few years that Pooja's been creating with us, she's earned over $900 toward her college education! This is a huge amount of money for that area, and something her parents were simply unable to provide for her. 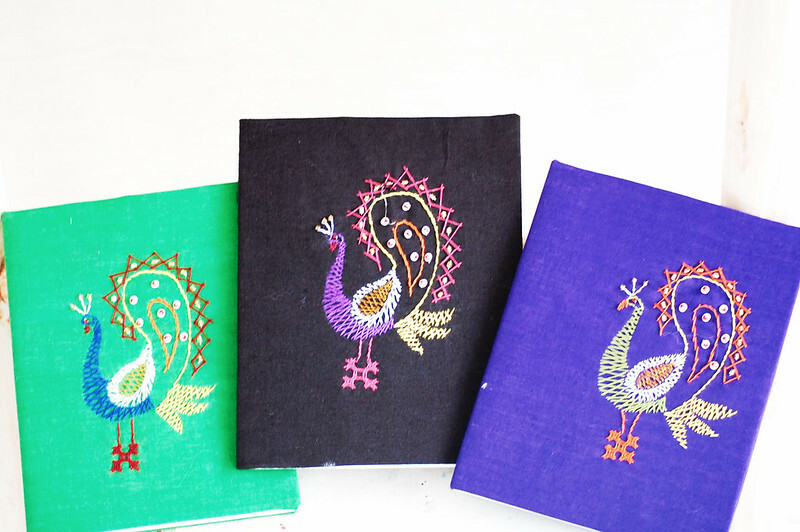 When you purchase an embroidered journal or Sari Pin bracelet, you're not just spending getting a beautiful item. Your purchases are quite literally putting this girl through college and transforming her family's life! Thank YOU from the bottom of our hearts for supporting Pooja and the 59 other incredible ladies of The White Peacock! When people like you chose to use their buying power for good, lives and entire communities are transformed. Together, let's break the cycle of poverty and educate more young women like Pooja! 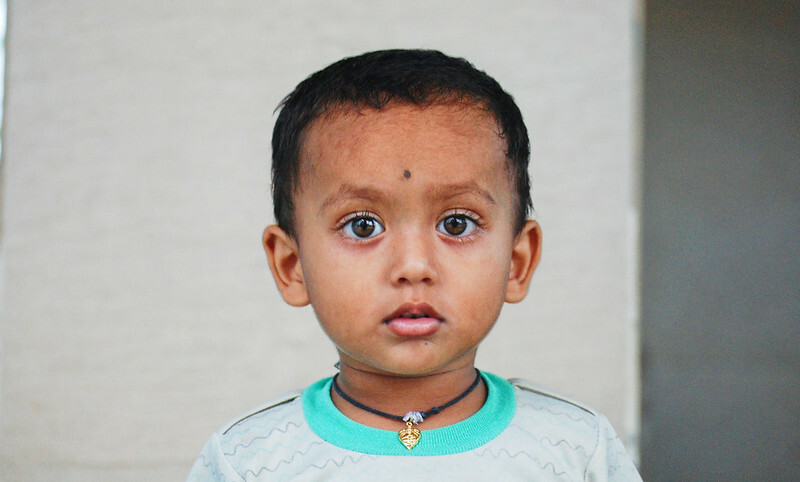 Share Pooja's Story On Pinterest! Oh wow, those journals are beautiful! Buying ethically sourced is such an important decision. I wish more attention was given to where we get things. seems all anyone cares about is the best price. Thanks for sharing this inspiring story! What an inspiring story? I wish her much success!